Norton® FEP fluoropolymer film is manufactured from flourinated ethylene propylene (FEP) resin by Saint Gobain Advanced films and Fabrics in four grades. FEP Type FG utilizes the low dielectric constant and dissipation over a wide range of temperatures and frequencies for a low signal distortion and attenuation in flexible printed circuit and flat cable applications. The high surface and volume resistivity minimizes current leakage and provides excellent insulation in wire and cable applications. Norton® FEP also provides the chemical and thermal resistance to withstand aggressive environments, making it an excellent candidate for diaphragms, gaskets, protective linings, sample bags, and containers. Fabricated shapes and contours can be produced via heat sealing and thermal forming. The outstanding weatherability and optical properties of FEP film provide excellent performance in environmental growth chambers and solar collectors. FEP Type FS is a translucent film made from high molecular weight resin for applications where high flex life and stress crack resistant performance is required, such as tank linings and diaphragms. FEP Type RF is a clear or pigmented film designed for release applications. The non-stick surface, chemical resistance, and 205°C (400°F) usage temperature make FEP Type RF an ideal release film for composite molding over a wide range of resin systems. High elongation and a smooth, low gel film surface allow FEP to conform to complex mold contours and produce a smooth part finish. 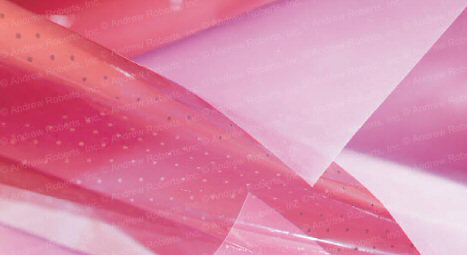 Perforated film is available to control outgassing and resin bleed. Pigmented films increase visibility to speed removal from parts and mold. PTFE zone tape is primarily used in applications where it is not desirable for adhesive to come in contact with a heating element. PTFE tape for packaging machinery is manufactured by coating fiberglass cloth with PTFE, The material is then etched on one side which allows it to accept an adhesive system. All thermal flame spray tape comes with a pressure sensitive silicone adhesive that performs well in temperatures as high as 500°F (260°C).